Plot: A former secretary, newly appointed as a scriptwriter for propaganda films, joins the cast and crew of a major production while the Blitz rages around them. Starring: Sam Claflin, Gemma Arterton, Nicholas Murchie, Richard E. Grant. 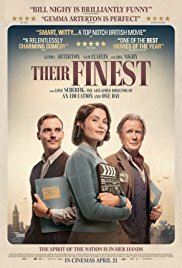 distributed by STX Entertainment «Their Finest» in the US movie theaters released on April 7, 2017 and has grossed over $4 million worldwide; dvd and blu-ray release date was set for July 11, 2017. Rent from Netflix and Redbox from July 11, 2017. «Their Finest» in the UK released in movie theaters on April 21, 2017. The movie released on dvd and blu-ray on August 21, 2017.